Learn how to make the simplest of money origami - the dollar bill shirt! This easy origami shirt is an awesome gift for decorating greetings cards! Whether this is for your Dad, husband, boyfriend or colleague, they will appreciate the extra time and effort spent on a handmade greetings card. 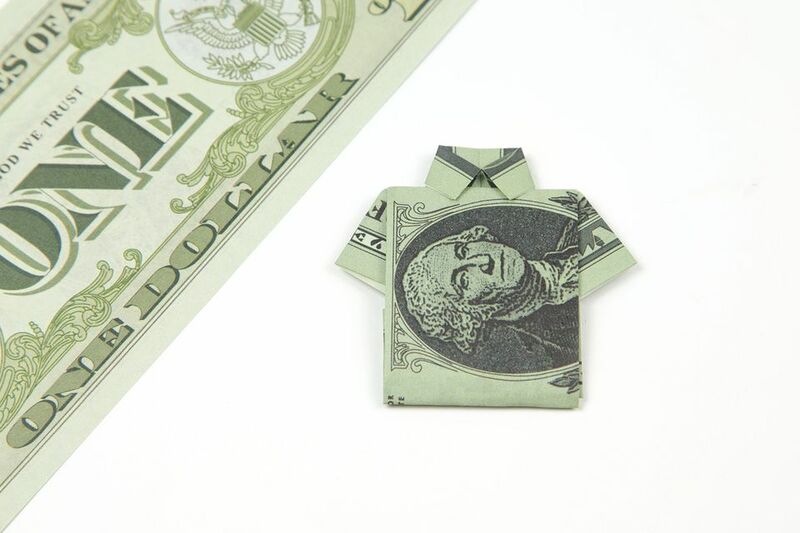 For this easy to make origami dollar bill shirt, you'll need - a dollar bill! If you'd like to use larger paper, the dimensions don't matter a great deal, just make sure it is a long rectangle. Different heights will give different results. To get exactly the right dimensions depending on what paper you want to use, check out the origami paper ratio calculator. For reference, a dollar bill is 2.61 inches wide and 6.14 inches long, the ratio is 1:2.352. Start with your paper white side up, or with the side you don't want to see facing up. 1. Start off by taking the bottom edge of your dollar bill or paper, and fold it up to the top edge, creasing well. 2. Now you can unfold your paper back to the start. 3. Next, take the top edge and the bottom edge and fold them neatly into the central crease that you made in the first step. Tip: Make all of your folds as neat as possible, take your time and the end result will be awesome! 5. Fold one end of your paper over to the other side. You can make this fold any size you'd like, this will be your collar, so you can decide how tall your collar will be! 6. Keep your paper facing up the same way as before, with the flaps facing up. 7. Concentrating on the end with the collar flap, take the bottom right corner and fold it diagonally up to meet the central crease. Again, you can experiment with the angles here. 8. Next, fold the top right corner down to match the bottom one. 9. Next, fold the left end of your shirt about a third of the way over to the right. For longer shirts, fold it less. 10. When you've folded the left end over to the right again, tuck it under the 'collar' and crease well. 11. Open out your last few folds and rotate your paper so that you are looking at the end with no collar. 12. Open out the flaps and reverse the outer folds, as shown. Hold on to these pleats as you flatten the shirt back down, and they will become the arms! 13. Here it is after refolding the top section down. The arms can also be adjusted as you like. 14. Fold the bottom edge back up, flip the paper over and pop it under the shirt's collar. The origami shirt is now complete! If you found any of these steps tricky, perhaps this quick video tutorial might help you to finalize the model.